New York: W.W. Norton, 1963. THERE WERE TOO many names, events, and causes to list here­. One is reminded of the 1953 movie, The Wild One, where a motorcycle-riding rebel, played by Marlon Brando, roars into a small California town hellbent for destruction. An impressionable young woman looks admiringly at Brando and asks, "What are you rebelling against?" Brando looks off in the distance and replies: "What do you got?" It seemed as if every festering injustice, every perceived inequality was suddenly ripe for examination and protest, and innumerable committees, organizations, and parties sprang up to address a wide variety of social concerns. Some of the more pressing and vocal issues were women's rights, the environment, gay liberation, students' rights to free speech and protest, and the ordinary citizen's right to assemble and demonstrate. THOSE DARN SOCKS just never seem white enough! Before Betty Freidan's groundbreaking book, society calculated a woman's worth largely by how successful she was in achieving domestic bliss for her husband and children. Friedan conducted a survey in 1957 among Smith graduates, where she noted the disparity between the level of the education of the women and what they were accomplishing in their lives. 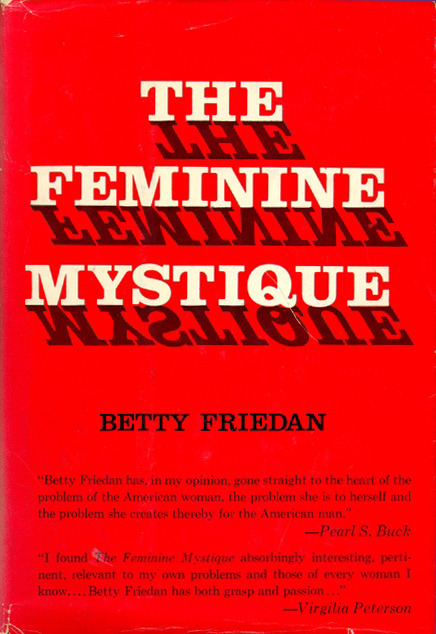 The Feminine Mystique is the book that followed. Perhaps the single most important factor in the creation of the modern women's movement, The Feminine Mystique effectively demolished the fifties concept of what it meant to be a woman in American society. In 1966, Friedan cofounded the National Organization for Women and became its first president. New York: Olympia Press, 1968. 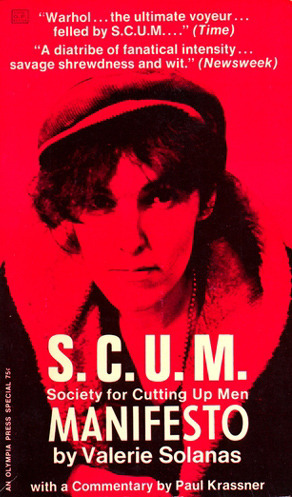 RADICAL FEMINISM'S MOST notorious adherent was Valerie Solanas whose manifesto called for a Society for Cutting Up Men. She had few disciples, and Solanas, a frustrated writer-actress, gained notoriety as the woman who shot Andy Warhol after he refused to use her script for a movie. Correspondence dated August 11, 1969. 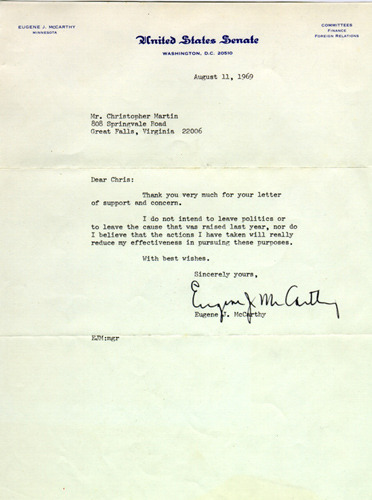 A LETTER FROM Senator Eugene McCarthy who had sought the Democratic nomination for the Presidency in 1968. Mr. McCarthy is apparently declining to remove himself voluntarily from office as suggested by Christopher Martin, an SDS activist. SOME OF THE most violent and prolonged student protests were held at the University of California at Berkeley, Columbia University, and San Francisco State University. There were strike forces or committees formed to coordinate protest marches and rallies, the occupation of buildings, and efforts to shut down the institutions. Shown are three publications relating to protests at those institutions. Jann Wenner, ed. 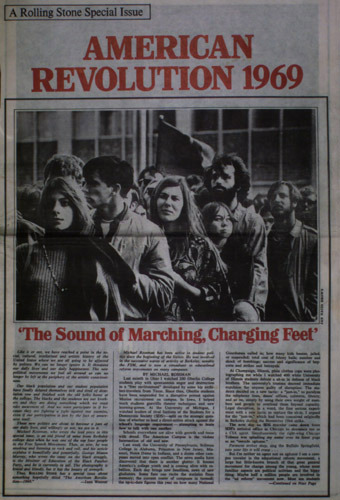 Rolling Stone Magazine Special Issue: American Revolution 1969. San Francisco: Straight Arrow Publishers, April 5, 1969. AMERICA'S FOREMOST ROCK music magazine weighs in on the American Revolution. 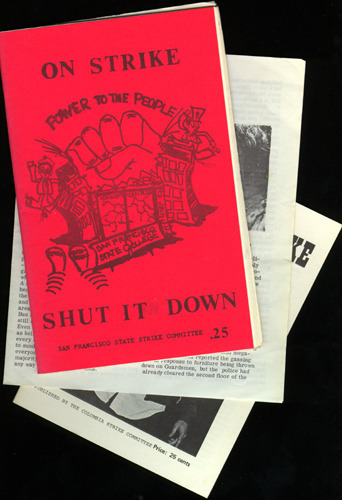 Inside are articles by Michael Rossman, an organizer for the Free Speech Movement and George Mason Murray, Minister of Education of the Black Panther Party. Also included is an editorial by Jann Wenner, founder and editor of Rolling Stone. New York: Legal Rap, 1969. WRITTEN WITH THE New York laws and police customs in mind, this is a primer for those whose activities were likely to put them into confrontation with the authorities. It contains information about what to do when arrested: 'Don't talk to the police', 'What happens to you at the police station,' 'finding a bondsman, plea copping and representing yourself in the courtroom.' A section written by Abbie Hoffman relates the circumstances of one of his many arrests. Stewart Brand. 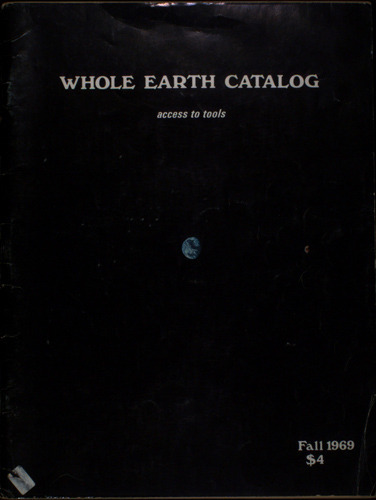 Whole Earth Catalog. Sausalito: Whole Earth Catalog, Fall 1969. 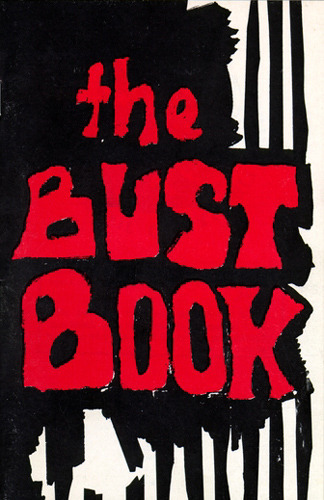 STEWART BRAND, FOUNDER and editor of the Whole Earth Catalog, studied design and photography at San Francisco Art Institute College in the early sixties and joined Ken Kesey's band of Merry Pranksters in 1964. Four years later, with numerous miles logged on the famous bus Furthur, Brand started publishing the Whole Earth Catalog, which became the bible for those who had decided to drop out of society to seek their spiritual fortune in the wilds of nature. The 'Economist' described Brand's magazine as a "philosophical tract that endeavors to make shopping via the catalogue a spiritual experience . . . it has become the bible of the commune and the creator of cults. Earth is the theme throughout." Although initially very successful, as interest waned in living in the wilds, the magazine lost market share and folded in 1971. Shown is an issue from late 1969. 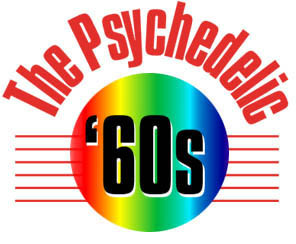 IT WOULD BE a decade before Gay Liberation gained prominence among the activist groups, but it was in the sixties that some gays began to profess their sexual orientation and openly demand justice under the law. 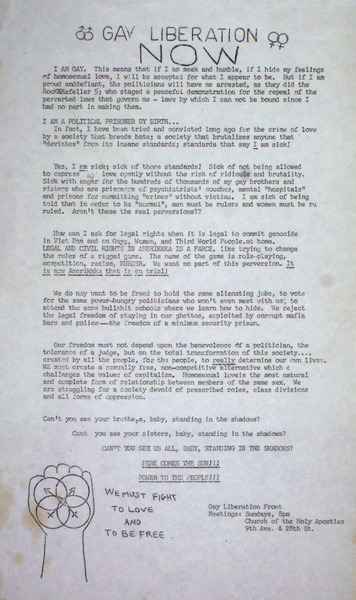 Shown is a declaration put out by the Gay Liberation Front.